Zinniel Electric is now providing a sustainable and renewable approach to all your electrical needs through the installation of PV/Solar technology. Every dollar invested in energy conservation results in a $5 return on your investment. Solar power makes sense. There are no moving parts; consequently it is highly reliable with little maintenance. Sunshine is free and the Midwest receives an average of 5 hours of sunshine per day. Fossil fuel costs increase between 3-5% per year. Generate your own supply of clean energy and play a role in creating a cleaner environment. The federal and state governments are currently offering tax credits and rebates for the installation of PV/Solar solutions. This helps free the US of its dependency on foreign oil and strengthens our economy. 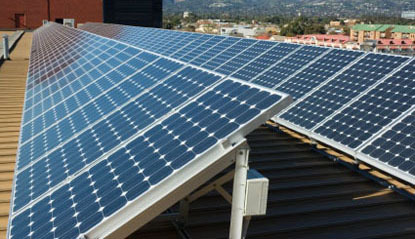 PV/Solar also provides backup power for your home in case of outages. Zinniel Electric is proud to be a leader in the installation of this proven and cost effective technology. Learn more on how Zinniel Electric is the right choice to be your Solar PV Contractor. Are you interested in learning more about solar technology, renewable energy, and how it relates to YOU? Consider attending a Solar Power Hour seminar (either online or in person). Sponsored by Midwest Renewable Energy Association, these events are an excellent informational resource to consider. For dates and locations, or more information, visit here. "Scheduled an appointment, they arrived on time and was very courteous. Work was excellent and he was friendly and polite."